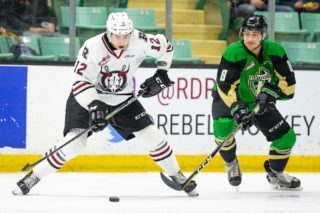 Tuesday’s announcement regarding the re-location of the Kootenay Ice franchise to Winnipeg at the conclusion of the current WHL season caught virtually no one by surprise, including Red Deer Rebels players Cam Hausinger and Brett Davis. 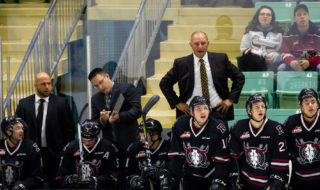 The former Ice forwards, acquired by Rebels GM/head coach Brent Sutter in late November (re-acquired in Hausinger’s case) weighed in on the situation Tuesday prior to an afternoon practice session at the Servus Arena. “I can’t say it’s really surprising. 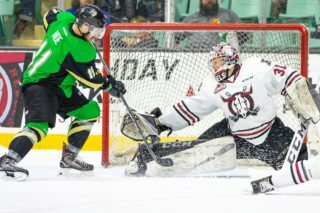 I don’t think anyone in the organization would say it’s surprising,” said Hausinger, who was dealt from Red Deer to Kootenay in the summer of 2017 and played 97 games in Cranbrook. Hausinger was of the opinion that Cranbrook citizens realized the move was inevitable due to dwindling fan support in the small market city and were relieved when it was finally announced. 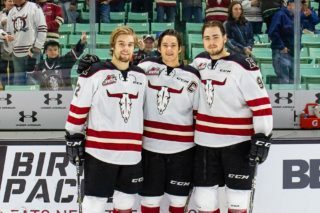 The rumours, after all, started circulating in 2017 when the WHL board of governors approved the transfer of ownership of the Ice franchise from the Chynoweth family — which moved the Ice from Edmonton to Cranbrook in 1998 — to Greg Fettes and Matt Cockell of Winnipeg. That being said, Hausinger sympathized with the faithful Ice fans in Cranbrook and insisted he enjoyed his time playing there. “I had new billets this season but their parents were big fans and were always big fans. I know they’re shook up,” he stated. “I loved it there. My billets made it really special for me and obviously the guys (teammates) too. I’d never been part of a small town like that. It was really cool to be in that atmosphere and that area. 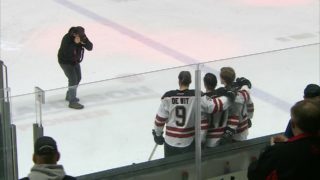 Davis, who was dealt to Kootenay from Lethbridge at the trade deadline in 2017 and played 126 games with the Ice, also expressed sympathy for the Cranbrook fans. “It’s something that there’s been a lot of speculation about. The team has been in Cranbrook for quite some time now and I think it’s a sad day for the city and the diehard fans,” he said. The team will play out of the smaller University of Manitoba Wayne Fleming Arena for two years while a new facility, with at least 4,000 seats, is being built on the south side of the city. The team will also be competing with the NHL Jets and the AHL Moose for fans. But if there’s a major city in western Canada that can support three high-calibre teams, it just might be Winnipeg, which happens to be Davis’ hometown. Of course, the good news for Winnipeg is bad news for the long-time Kootenay Ice fans. Cranbrook still has major junior hockey supporters, just not enough of them. “They had some good fans and some diehards who had been going to games as long as the team has been there,” said Davis. The Wheat Kings went into Tuesday’s game versus the host Edmonton Oil Kings with a record of 20-19-3-3 and sat fourth in the East Division and ninth in the Eastern Conference . . . C Stelio Mattheos paces all Brandon scorers and had garnered 30 goals and 66 points — ninth among league scorers — prior to Tuesday. The Wheat Kings, 5-5-0-0 in their previous 10 outings, also feature C Luka Burzan (26-26-52 prior to Tuesday) and C Conner Gutenberg (11-21-32) up front, while D Zach Wytinck entered Tuesday’s contest with 27 points (3-24). Other forwards with double digits in goals are left wingers Cole Reinhardt (15), Ben McCartney (12) and Linden McCorrister (11 in 32 games) . . . Wheat Kings regular starter Jiri Patera is 20th among WHL goalies with a 3.21 goals-against average and 13th with a .910 save percentage . . . Patera was selected by the Vegas Golden Knights in the sixth round of the 2017 NHL entry draft. Mattheos was taken by Carolina in the third round in 2017 and D Braydyn Chizen, recently acquired from the Kelowna Rockets, was a seventh-round pick of the Minnesota Wild in 2016. Injuries: Brandon — C Jiri Patera (lower body, day-to-day), LW Linden McCorrister (upper body, day-to-day). Red Deer — Alex Alexeyev (upper body, week-to-week). Special teams: Brandon — Power play 22.3 per cent, eighth overall; penalty kill 70.9 per cent, 21st. Red Deer — Power play 20.9 per cent, 14th overall; penalty kill 78 per cent, 14th.